Imagine my delighted surprise to sign onto to my email this morning and find a message from the Museum of Anthropology. Yes, the last two pieces by Bill Reid which were stolen from the Museum have been found and returned to them by the RCMP. 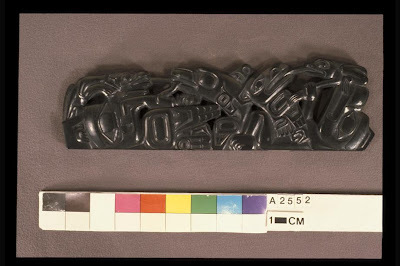 Unfortunately while the gold eagle brooch was recovered intact, the carved argillite pipe below was recovered with approximately two inches of it broken off. But the search will continue for the missing piece. Those mounties never give up! Sad to say that they will not be on display for some considerable time as the Museum is closing for six months on September 2nd for the final stage of their big renovation project. But on the bright side they are having a big closing party on the last day, with eats and drink and dancing to live music so I should go to that. My membership to the Museum has been extended for six months so I will not be losing out on that but I will miss going to visit, especially to get my fix of the Raven and the First Men and I will miss the shop which gets such a lot of my business when I am looking for gifts. Photo ** is from the RCMP in BC site. I really like this eye of Horus image so I feel I can use it again to update you on the state of my eyes. Just over one week post operative I am seeing very well and hopefully now have two good bionic eyes. The biggest problem is that my new eyes do not fit my old glasses and I can’t get new glasses until after my next appointment with the ophthalmologist which is in seven weeks. Now I wear bifocals, not the nolines things that are so fashionable these days — the ones with the scrinchy small reading segment, the ones that require you to tilt your head this way and that to be able to read things — but ones with a big reading segment. Even with the new bionic eyes I will have to wear glasses for reading and since I don’t wish to be constantly searching for my glasses I will continue to wear bifocals but with plain glass in the upper part. Besides, as a friend of mine always says, glasses hide the bags under your eyes and what’s not to love about that! However at the moment I find I can no longer wear these current glasses while driving and they are not really great for walking around either, so as well as stumbling around in Second Life I am doing so in real life. I sure hope I don’t fall and break something during this interim period. Sigh! Only seven weeks to go. That was the this and now for the that. 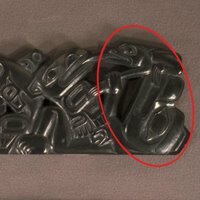 I heard today that one of the Bill Reid art pieces, stolen last month from the Museum of Anthropology was pawned in a local pawn shop but reclaimed very quickly afterwards, no doubt due to the publicity. I wrote about the theft and the recovery of the majority of the pieces recently. A friend heard about this on the radio and told me since she knew of my interest and I found this single article in the Globe and Mail online. Meanwhile, a media report suggests charges may never be laid in the case. According to the CBC, a deal was worked out with the suspects, offering immunity or at least leniency if the artworks were recovered intact. Unfortunately there is no new information on the two pieces which have not been recovered, despite the widespread publicity surrounding them, but I am sure the RCMP are still working on the case. Although the Mounties “got their man”, he/they could well not be charged, but the most important thing is that most of the pieces were recovered intact. On returning from my eye surgery this morning I was elated to find an email from the Museum of Anthropology regarding the art objects by Bill Reid which as I told you had been stolen recently. The recovery of some of the objects had been announced on the news two days ago but with no details whatsoever, as the investigation was still in progress. At today’s press conference by the RCMP it was announced that 13 out of the 15 stolen pieces have been recovered however two pieces are still missing, the one above and the one below. Description: Panel pipe with holes for stem and bowl drilled through material. Design consists of an eagle and bear prone at base; eagle holds a man’s legs in his mouth while bear holds a frog. Above is a killer whale, surmounted by a wolf and a raven with a frog. 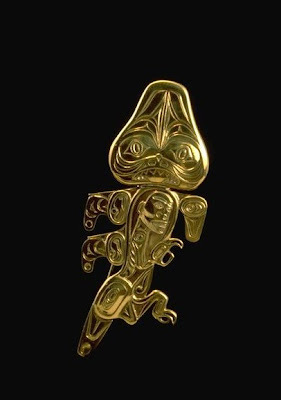 The objects, which included twelve original works by renowned Haida artist Bill Reid and three items of Mexican jewellery, were the subject of an intense recovery effort initiated by the RCMP immediately following the break-in. 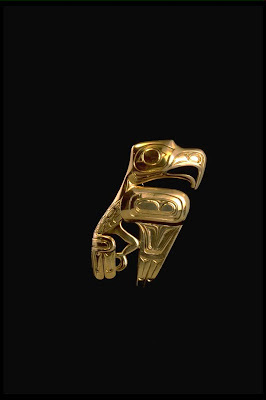 Among the recovered items are Bill Reid’s extraordinary gold box with a sculptured, three-dimensional eagle on top, his gold Frog brooch, and two bracelets. An argillite pipe and an eagle brooch, also by Bill Reid, are still missing. I don’t know how long it will be until these objects are returned to the museum and can be displayed once more for they will be held as evidence, probably for a very long time. But I am sure when they are returned there will be a big celebration. I am delighted to say that my favourite, the gold box with the eagle, which was my photo for this post has been recovered. Yes, the surgery went well, everything is fine, fine, fine! Thank you for asking. Yesterday, as a member of the Museum of Anthropology I received an update on the situation regarding the theft of the Bill Reid art objects from there this past weekend. It did indeed include the box I featured in my post yesterday along with 14 other objects, photos of which can be found here and the image below comes from that site. This is a wonderful example of his work which combined his talents as an artist with his skills as a jeweller, his earlier profession. 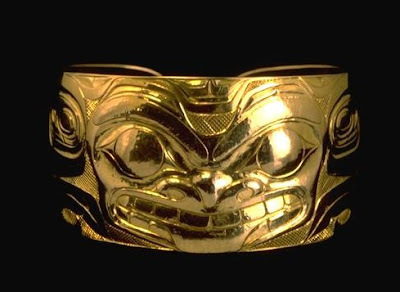 Since the theft included three gold Inca necklaces, along with the twelve works of Bill Reid, I am sure that many people believe they were taken for the gold content. With that in mind the University of British Columbia has offered a reward of $50,000 for information which leads to the recovery of the stolen items. While they are valued at $2 million dollars as art works they have a total gold content worth a mere $15,392 at current gold prices, which is a quite sobering thought. To this end, the University of British Columbia is posting a reward of up to $50,000 for information leading to the safe return of the stolen artworks in their original condition and the arrest of any suspects involved in the theft by June 30, 2008. Of course perhaps the thieves already had in mind a buyer who would quite happily hide them out of sight, keeping their beauty for himself alone. Let’s hope they are not already melted down. Someone, somewhere, will know something. Hopefully it is not too late and we will see them returned to their display cases in the rotunda at the museum where Bill Reid’s monumental carving of the Raven and the First Men resides. I look forward to giving you a final update on this situation with the good news that they have been recovered. We all know that the Mountie (RCMP) always gets his man and may this not be an exception to that rule.